Relationships between Ankara and Tashkent soured after Muhammad Salih, the leader of the Erk opposition party of Uzbekistan and the main opponent of late Islam Karimov, settled in Turkey in mid-2000s. Tashkent has repeatedly hinted expelling him would be something the Uzbek leader would prefer; however, Ankara turned the blind eye on such requests. Furthermore, the Turkish authorities have voiced support for holding an international independent inquiry into the Andijan events of May 2005 and condemned Tashkent for using child labour during cotton-picking campaigns. Responding to Ankara’s moves, Tashkent banned Turkish soap operas on Uzbek national TV channels n 2012, and exerted pressure on Turkish businessmen in the country by deporting and/or arresting them. Vahid Gunesh, the former director of Turkuaz—a large trade centre in Tashkent—who was deported from Uzbekistan, told news outlets in April 2012 that he had filed a lawsuit against the Uzbek authorities for torturing him and demanded returning his confiscated property. Mr Gunesh said he was detained at a pre-trial detention facility of the National Security Service’s Yunusabad Regional directorate in Tashkent for 9.5 months where he was tortured. 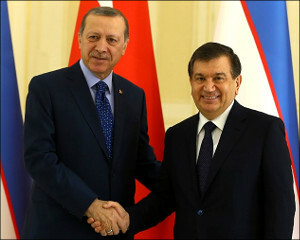 That said, two-and-half years ago a vague hope emerged that Uzbekistan and Turkey were improving bilateral relations. After all, Karimov and Erdogan met at the opening ceremony of the Sochi Olympics in Russia. Even the Uzbek mass media outlets reported on the meeting offering further credence to the idea that relations were warming up again. However, no further steps were taken. Erdogan and Mirziyoyev have similar backgrounds: both were premiers for over a decade and then became presidents. (Obviously no-one doubts the events will unfold in Uzbekistan just as they were scripted by powers-that-be in Tashkent.) Relationships between the two countries collapsed on their watch, so to speak. Could Premier Erdogan and Premier Mirziyoyev have done anything earlier to somehow improve the situation? Perhaps, not. Because the main obstacle on Turkish-Uzbek friendship’s way was, of course, late leader of Uzbekistan Islam Karimov; specifically: character and ambitions that anyone has and especially if that one is an autocratic ruler. But Islam Karimov does deserve some credit—he has never bowed to anyone and responded to blow with blows and with stubbornness to others’ stubbornness. Put otherwise, he was not always flexible with his partners. One could observe this not only in relations with remote partners, Turkey for instance, but also with those closer to home—Tajikistan and Kyrgyzstan… The new Uzbek leadership is directly and indirectly admitting this fact, so the top brass is scrambling to rapidly mend or at least attempt to fix problems with 25-year-long history with neighbours be it border, water or trade issues. Both Turkey and Uzbekistan will benefit from embarking on a new journey with clean sleet. The Turks have established more or less amicable relations with the other countries in the post-Soviet Central Asia. Only Uzbekistan was the only member of the “Turkic family” who was capricious and made no compromises. Therefore, should Recep Erdogan be able to convince Shavkat Mirziyoyev he comes with good intentions, the Turkish president would collect wealth of political points back home. On the other hand, Shavkat Mirziyoyev stands to reap significant benefits from the visit of any foreign leader to Uzbekistan at this time. One cannot think of any better contribution to his pre-electoral campaign for the presidency of Uzbekistan. The more foreign leaders bow their heads over the first Uzbek “yurtbashi” grave the more points his lucky successor collects. The past is in the past? Signs of improving Uzbek-Turkish relations could be soon almost immediately after Islam Karimov passed away. For instance, on October 18, Tashkent launched bilateral talks between the foreign affairs ministries of the two countries. That is perhaps when Erdogan’s visit to Samarkand was finalised and confirmed. But can Erdogan and Mirziyoyev overcome mutual distrust sown in the Karimov era? Yes, they could, if Tashkent will own its mistake of confiscating property of Turkish businessmen and expelling them in 2010-2012. There are still trials underway regarding certain cases: businessmen are trying to return what was taken away from them—property, assets and money. To be sure, Tashkent must not only own that guilt and mend the situation, but must also guarantee no such thing would occur in the future. Yes, they could, if Turkey and Uzbekistan can agree on oppositional Muhammad Salih who now lives in Istanbul and remains a certain political threat for the official Tashkent. That said, there are hundreds and thousands of Uzbek opposition figures, religious activists and businessmen who fled the violence and torture of the Uzbek secret services and settled in Turkey, a safer country with familiar culture. What about them? And, yes, one more time, if Tashkent and Ankara will simply pretend these problems do not exist and forget mutual offenses for the sake of beneficial cooperation in future. In an ironic twist, the ambitions, capriciousness, flexibility and stubbornness of the leaders are the driving force again.